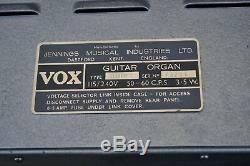 RARE - Vintage Vox Guitar Organ "V251" Model Guitorgan Here's one you won't see very often. 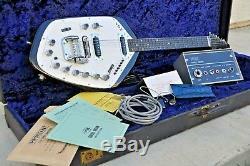 It's an incredibly rare mid-60s Vox "Guitar Organ" hybrid guitar/organ instrument. 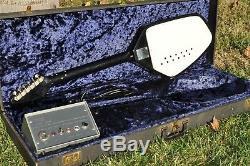 It's a truly outrageous instrument that sounds and is as funky as its iconic 60s Phantom guitar shape. 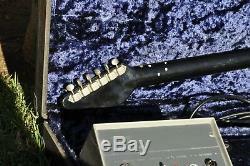 Basically, what you have here is a short-lived production instrument where Vox added the guts or soundboards of it's Continental organ into the body of a Vox Phantom guitar shape (but thicker, to accomodate the electronics), and the frets are segmented to complete each "circuit" (like an organ keyboard) and make the organ sounds. In true 60s Vox fashion, they also stuffed a ton of on-board effects, including percussion and all sorts of switches and gadgets. Absolutely an instrument OF it's time. It's said that only a few hundred of these were made, and they're rarer in black. The very first one was given to John Lennon, and it's rumored that Brian Jones received the second one, as a pre-production item. This one is mostly working - ALL of the organ notes on the fretboard WORK, which is the most important part. 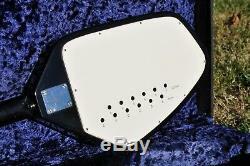 The guitar functions normally and both pickups work. 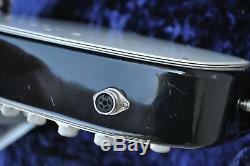 The percussion on-board effects are not currently working, nor is the electronic "pick" that is included with the guitar. It's really been sitting for years, so a competent organ tech or electronics guy could sort this stuff out. The organ notes can be adjusted or "tuned" to match the guitar (via the screw adjustors on the backside), and it's a bit out-of-tune, I haven't messed with it. The best part of this particular example is all the cool stuff that comes with it. 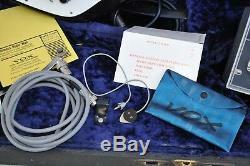 Not only is the main stuff there - Vox power box, OHSC, both cables, vibrato arm, electronic pick etc, but it has a TON of case candy and ephemera, including the original registration card, user guide and other materials. There is some lacquer checking, along with some paint chips on the back of the neck. 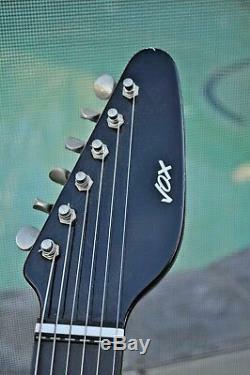 Very normal for these guitars (I've owned two of these before), as the neck is actually made of aluminum. This instrument is extremely heavy (seriously, folks). 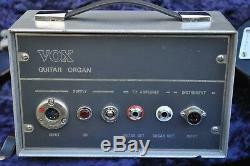 The item "Vox Guitar Organ V251 WORKS! 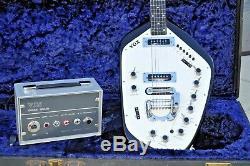 Guitorgan Beatles John Lennon 60s JMI Phantom VI" is in sale since Monday, January 21, 2019. 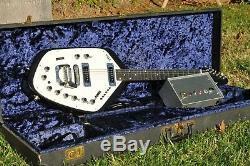 This item is in the category "Musical Instruments & Gear\Vintage Musical Instruments\Vintage Guitars & Basses\Electric Guitars". 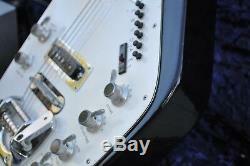 The seller is "whicol2" and is located in Corona, California.